i did quite some work with the UI Editor last days and got most things working. But there is one thing i spent hours of trial and error without any result.. I want to move the Inventory Container Frames 00 and 01 to two different Positions. I managed to push them up and down as they seem to be locked to the inventory button Container frame but i want to position them free on the screen. You can use the function Move Dialog Item. I also tried it that way using triggers but always get an error message. Probably because you are setting it relative to inventory button container frame which has a specific dialog size and you are trying to move the frame out from the button container frame dialog. 1. Create a dialog with a size that is larger than the frame, say (1000,300) at (0.50) relative to top of screen. 4. 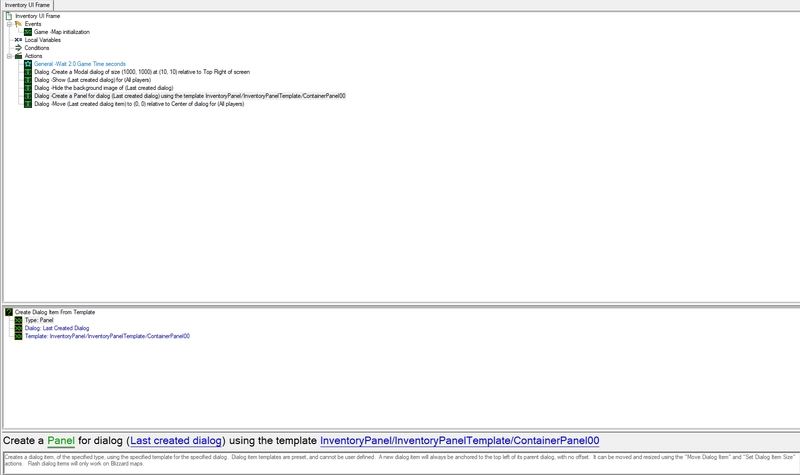 Create a panel for last created dialog using the template "UIContainer/ConsoleUIContainer/InventoryPanel/ContainerPanel00"
Try to experiment something like the above and see whether you are getting any more error issues. Thank you for the hint. Im going to try it this evening. I think the error i got said that the frame couldnt be loaded out of the path i entered. But from what i can say the entered path was correct. At least i can refer the frame with this path in the ui Editor. Maybe the format of the path has to be different when doing it via triggers? Maybe i can upload my Trigger in a new map if i still dont get it to work today so you can have a look what im doing wrong .. I think the error i got said that the frame couldnt be loaded out of the path i entered. You can try the example that I gave you in the above, by creating a new dialog and with it the frame panel and see if it works. If the issue still persists, perhaps you can attach a picture of your triggers to see what went wrong. You can mess around with the frame anchors where in the example below, I set the anchor side to Top offset by -40 and Right in the Mid (Middle) position. Then, go to the Game UI Data in the Editor and in the Custom Layout Files section, add the new layout file. Edited, can't create an Inventory Panel because they are Blizzard Only but however, you can move them around. Just go to the Game UI Data and in the Custom Layout Files section, add the layout file with the description as shown in the above. Hope this helps. 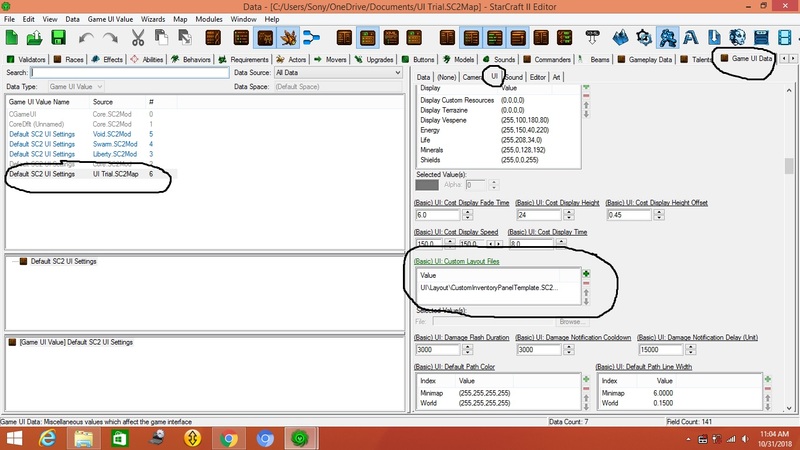 If i get you right, you mean i need to add it to the Game UI Data File in DATA EDITOR in the Custom Layout File Section? Are you able to attach a demo map where you did it?? I assume that you attached the layout file as per the image? Otherwise, it will not work. Aside from that, do you receive any error message? In regard to a demo map, I haven't tried it yet. But since I only received a message that it was attempting to add a desc with the same name of an already existing child, I assume that it works. Anyhow, I will try to attach a demo map probably by tomorrow to set up demo units, inventory units and triggers, etc. The following an attached demo map. You need triggers to create inventory dialogs, pick-up items, use items etc. FYI, I just picked someone else's demo map because I do not have the time to go through all the details. Do give credits to the owner of the map if used. Thanks. I thank you very much for all your work and help so far. Im going to check it this evening after work.